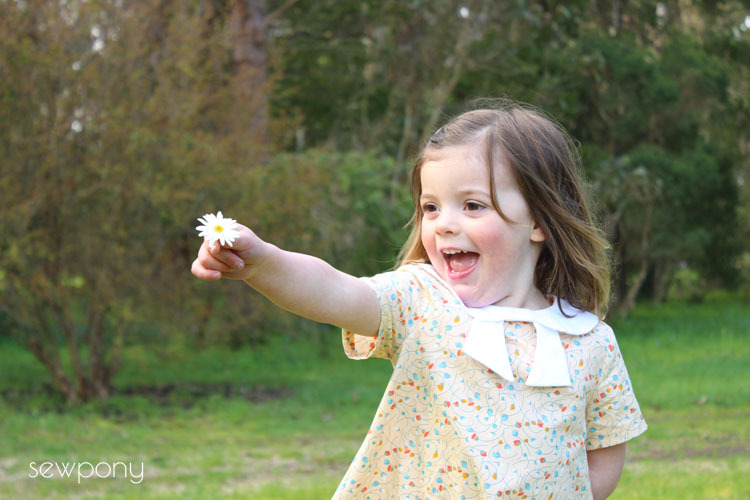 Introducing my first sponsor and a Norah dress for Emily! One of my favourite parts of sewing is choosing fabrics. I love it so much!! I was over the moon to receive happy mail from Hawthorne Threads recently in the form of beautiful fabrics, and I am very excited to announce them as sewpony's first sponsor. 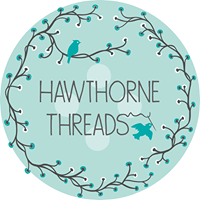 I have been a big fan and shopper of Hawthorne Threads since I started my blog a few years ago. Their online shop is beautifully laid out and they stock an enormous range of all the latest fabrics. Their postage rates to Australia are really good and you can fill your cart with around 8-9 yards of fabric and pay around $24 AUD postage. My mail has taken 1-2 weeks to arrive. My maths averages designer fabrics delivered by the metre (converted because I work in metres!) to around $12-$13 per metre (this obviously fluctuates depending on the exchange rate). 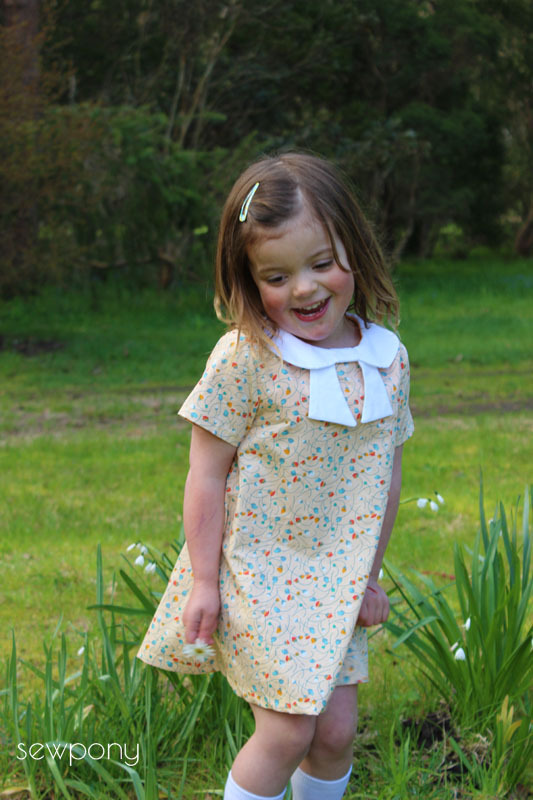 Over the next few months I will be featuring garments made from beautiful Hawthorne Threads fabric and today I am sharing some of my favourite fabric picks in some of my favourite colours as well as a dress I made for Emily from one of the prints below. My first five picks are in the coral pink colour palette. I adore this colour - so feminine and light. Mix it with mustard for a modern look or with creams and neutrals for a pretty and innocent feel. Lazy daisy in coral by Elizabeth Olwen, painters canvas in candy by Laura Gunn, deer in gold sparkle by My Minds Eye, delicate femme in apricot by Pat Bravo, desert blanket in desert by April Rhodes. The next five prints are in teal. This colour has become very popular amongst sewers lately. I love teal mixed with coral pink as well as pale blue. NY circuit in teal by Leah Duncan, wit in lake by Amy Butler, pristine poppy in teal by Joel Dewberry, quarter moon in dusk by Amy Butler, rose bouquet in eucalyptus by Joel Dewberry. The next five prints are in my favourite colour ever - duck egg blue (I also love the colour name). An antique colour that reminds me of old ceramics. It looks great with any colour! Mary thistle voile in spring by Anna Maria Horner, ink in teal by Alison Glass, triangle mosaic in aspen by Hawthorne Threads, birdies in sky by Laura Gunn, stitch petal in sea by Michael Miller. Mustard. An awesome partner to coral pink, duck egg blue, mint and cream. Bare nopal in gleam by Leah Duncan, praline in honey by Art Gallery Fabrics, crossed impressions in solar by Kristina Rocella, henna stripe in mustard by Bari J. Ackerman, essex in sunshine by Robert Kaufman. And now to share my dress. 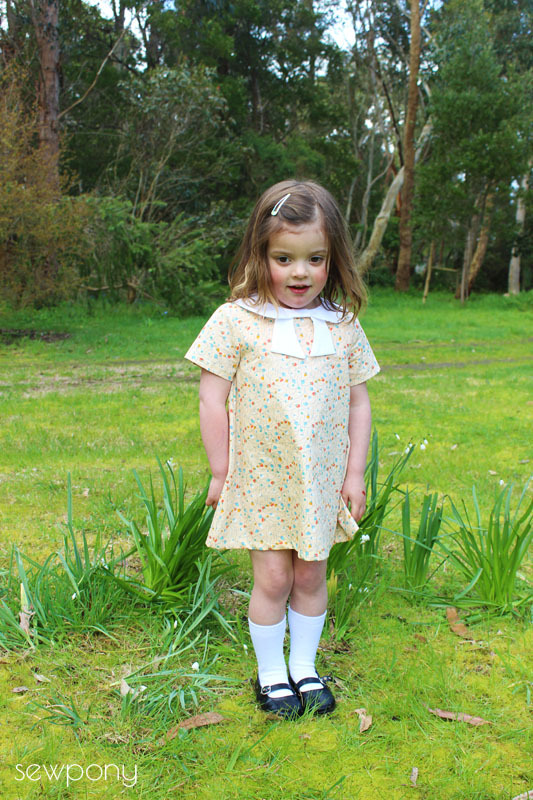 I made Emily a Norah dress by Mousehouse creations in delicate femme in apricot by Pat Bravo. This fabric is so feminine and pretty and suits Emily and this pattern so well. It is super soft with a lovely drape too. 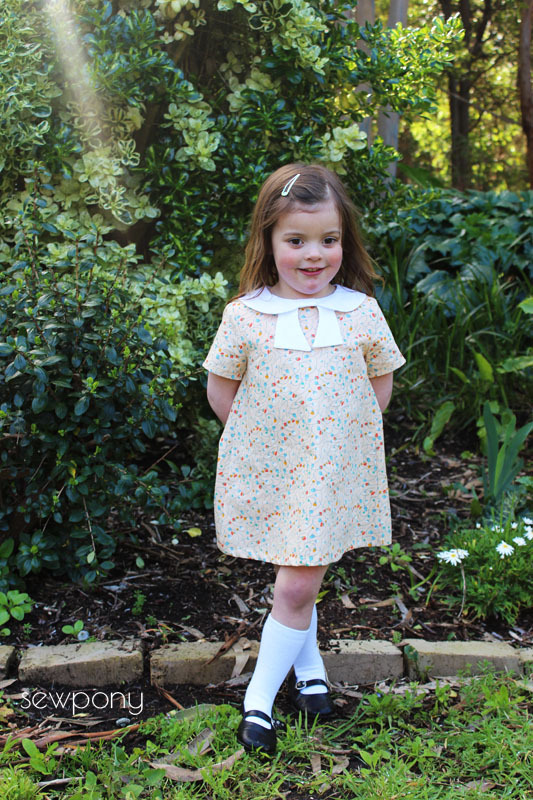 The Norah pattern is a great pattern - so quick and easy and so sweet and innocent!! I plan on using this pattern for Issie and Juliette's school uniforms for next year and also for some "Madeline" costumes for a friend's ballet concert. I love the collar. The pattern can be made sleeveless and also with long sleeves. The tails can also be omitted from the collar too. 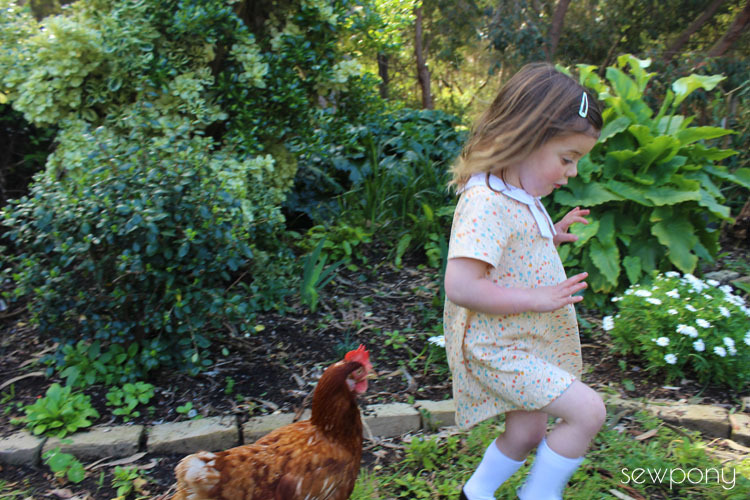 The photo below gives you an idea of what happens to Emily when the chooks are close by - they chase her! Perhaps she is just the right size. We love this little girl...she makes us laugh so much! Thank you so much Charlie and Lindsay from Hawthorne Threads for the wonderful fabric. I can't wait to share what else I will be making! If you follow me on instagram (@sewpony), you may have seen a sneak peek of Emily's quilt which is actually also from Hawthorne Threads fabric. It's all cut and ready to sew! 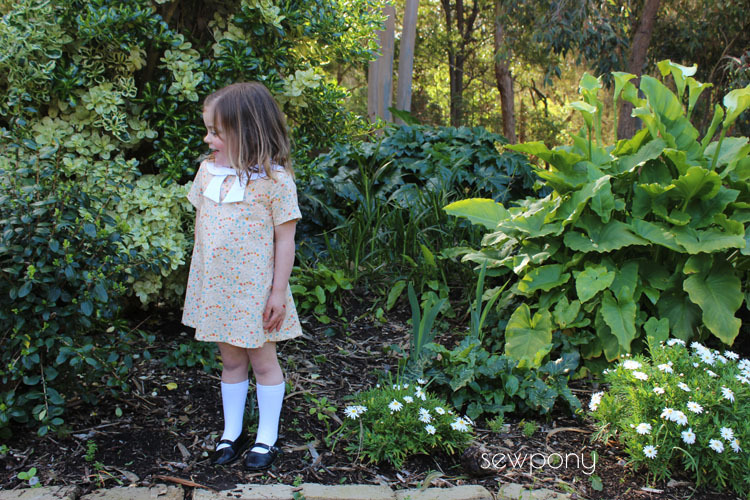 Such a cute dress for your little girl. Congratulations on this fantastic sponsor, have great experiences shopping at Hawthorne Threads! Awesome! I love Hawthorn Threads, congratulations! That's a great first sponsor! You are right, their shop is really beautiful and so is your daughter and her new dress!! Did you use current the ex-rate for your calculations? That's pretty good value. May need to make a purchase soon... I love the chook chase! Absolutely fabulous! I love her in the Norah dress and congrats on your first sponsor! Poor Emily is chased by the chooks... I feel mean but I had a giggle :) She is just the right size ;D Her new dress is wonderful. The fabric suits both the pattern and Emily so well! Congrats!